Well on the blog goes. 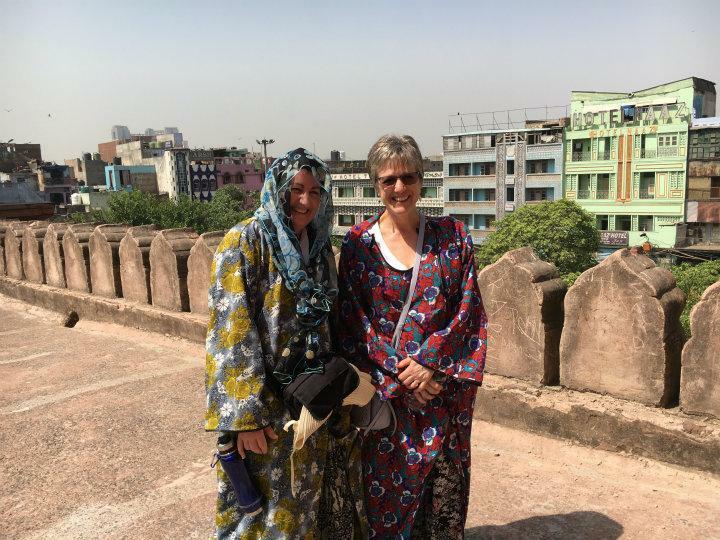 First official day of the Kouni tour and collected at 9:30 and after a drive round the red fort off to the Jama Masiid Mosque. We all left our shoes at the entrance and the ladies donned some rather fetching nylon curtains. The girls also got some rather fetching plastic carpet slippers and us men went barefoot, on the carpet and white tiles all OK, however when on the red sand stone there was a lot of white boy dancing as you faced with the choice of burnt feet or dying of heat stroke by moving to quickly in the 45C heat. After a look round the prayer hall we ascended the tower, this was a long long climb with more white boy dancing as went across one roof top. Once we got to the top spectacular views across the city. More photos with locals and even Vicky given a baby to hold at one point. Back to the tour bus and load up with more water and generate some short jealousy with my zip off shorts, rob still in long pants, ha!!! Leapt onto a couple of rickshaws and off round the old markets. Never that happy with people peddling like that for me but appears to be the required thing. Absolutely loved the markets with loads of tiny alley ways and all of life going on and being bought and sold. A strange stop at some old poets house, I am sure he's world famous in India but we had no idea who he was. Back on the rickshaws and into the spice market. Here everyone else choking but I am loving it, our little rickshaw boy is very keen to get us moving through without buying any of the spices as he takes round the corner to his favourite cousins shop where I buy lots of different spices and Vic buys some different Teas. Paid more than in the proper market around the corner, but hey ho all contributes to the economy. Back on the rickshaws and back through the market, I have to be held in to prevent leaping off and buying nan breads being baked in front of us. Back at the mosque we give the rickshaw boys their 300R with an additional 100R guilt money. Back on the bus and round to park and memorial at Raj Gat where Ghandi was cremated. Walk round in the burning heat before re-boarding the bus. Despite the aircon we continue to sweat like a set of coolies in the fields. Back in the hotel and sit down for a much needed beer and a bite to eat. Vicky starts to feel a bit off once the tea arrives (must be bad if she skips her cup of tea) and takes to bed with headache. Suspect a touch of heat stroke. Spend the rest of the afternoon snoozing and lounging by the pool. Rob over excited when I spot an Indian field pea hen on the roof next to us. Much studying of books and staring through binoculars. 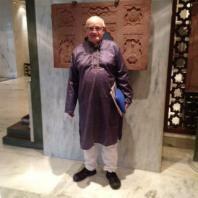 Vic still not well so just the three of us off to India Gate and out for dinner at the Pippi. Very nice chicken sag, chicken biryani and a veg pilaf. Even though only on her second day starting to raise Julies food spice levels. Back to the hotel and beer and bed. A quiet day but still packed a fair bit in. Dave Willford This Blog is now attractive for the first time.